The Craghoppers Nosi Trek are a good length, comfortable pair of socks which I've worn throughout the UK summer on numerous long day walks. The wicking is great so even at the end of some long, hot days there was no evidence of any 'hot spots' at all. The padding around your heel and toe is generous and the material is sufficiently elasticated to make ensure that the socks do stay in place. The fabric is relatively soft to touch which is good but I did notice some signs of wear after only a few outings. I've only worn the Nosi Treks in the UK but still managed to avoid any tedious insect bites so I assume the insect-repellant has been doing its job. The odour retention was minimal - however they do wash and dry very quickly anyway. 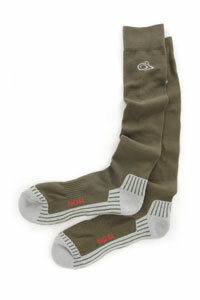 The Nosi Long Trek socks from Craghoppers are a comfortable and flexible sock that are long enough to wear with a higher cut boot. They are a good option for a variety of warm weather walking - particularly if you want to reduce the risk of the dreaded insect bites. We liked them and they are available at a good price - but don't expect them to last for ever!